In 2011, the Sarasota County Procurement Department was mired in a scandal that eventually led to the resignation of then-County Administrator Jim Ley. With succeeding administrators and staff having put much work into overcoming the problems of that period, the Procurement Department this year has been named a winner of the 2018 Achievement of Excellence in Procurement (AEP) award, presented by the National Procurement Institute (NPI). In fact, this is the fourth consecutive year the staff has achieved that distinction. 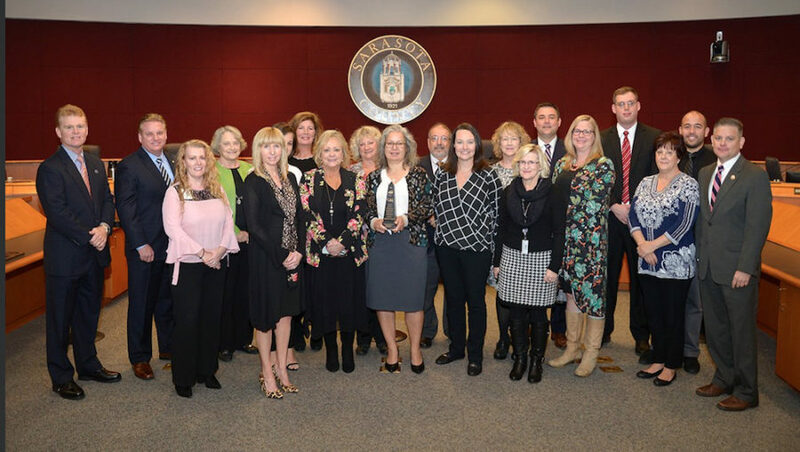 During the Nov. 28 County Commission meeting in Sarasota, County Administrator Jonathan Lewis invited members of the Procurement Department staff to the front of the room for formal recognition. “People have a tendency to forget,” he said, that county staff provides “an incredibly high level of service” — from the Sarasota County Fire Department’s responses to calls, to the Planning and Development Services Department’s processing of permits, to crews paving roads and completing drainage projects. “Noneof it happens without the resources we need to do the job,” Lewis stressed. To put the NPI award in context, Lewis explained, “there are some 35,000 local government entities across the country.” Sarasota County is one of only 45 counties this year to be honored by the National Procurement Institute, he added. Altogether, an NPI news release says, only 201 applicants for the award earned it this year. Each applicant was scored on the basis of standardized criteria, the release explains. The award recognizes innovation, professionalism, e-procurement, productivity and leadership in procurement, the release adds. During the County Commission meeting, Lewis told the audience that the honor makes it clear that the county’s Procurement Department staff takes all “the extra steps in the process” to ensure appropriate spending of “the people’s money …” The staff has been innovative, he added, including using automation to oversee procurement. In fact, Lewis said, the NPI is using about seven of the Sarasota County staff’s processes for procurement as models for the rest of the nation. Lewis then introduced Kim Radtke, director of the county’s Office of Financial Management. “NPI established the [award] in 1995,” the NPI news release notes. The AEP Evaluation Committee, which measures the criteria on which the recognition is based, comprises procurement officials from around the country, the release adds.